Water Conditions: New Melones Lake is currently holding 546,500 acre-feet of water. The lake level dropped just one foot this past week and it appears more water is being held and less is being released. It is currently at 867 ft. above sea level and 218 ft. from full. The water clarity is clear in most of the lake with a slight stain in some areas. The water temperature is warm, with the average being 78-82 degrees. There is still a two lane concrete ramp with a courtesy dock which should remain until 865' in elevation. There is also a courtesy dock on the dirt launch which will be in place for the remainder of the summer. Trout: Slow. There have been very few anglers heading out in search of trout. However, the size of the trout in New Melones this year is good. The last couple years we saw very few fish weighing over 2-pounds. This year we are seeing some quality trout ranging from 2 to 4-pounds and can expect to be catching these fish throughout the fall and winter. Trolling anglers in search of trout should troll in 100' deep water near the main lake and over the main river channel. The shad will be seeking refuge in cooler water and the trout will be nearby feeding on them. Larger lures will disperse water making them easy to find. There is very little light penetration in deep water and sound, vibration and scent become very important. Add scent to your lures and a piece of crawler to further entice strikes. Night anglers are catching some nice trout while fishing under submersible lights. The fish are near the deep water on the main lake and this should be taken into consideration when choosing a location to anchor. The light will attract fish from and distance. Be patient and wait for the baitfish to be drawn in. If the baitfish show up and the trout don't, wait awhile but don't be afraid to relocate. It might take a few stops to find and area that is holding trout. 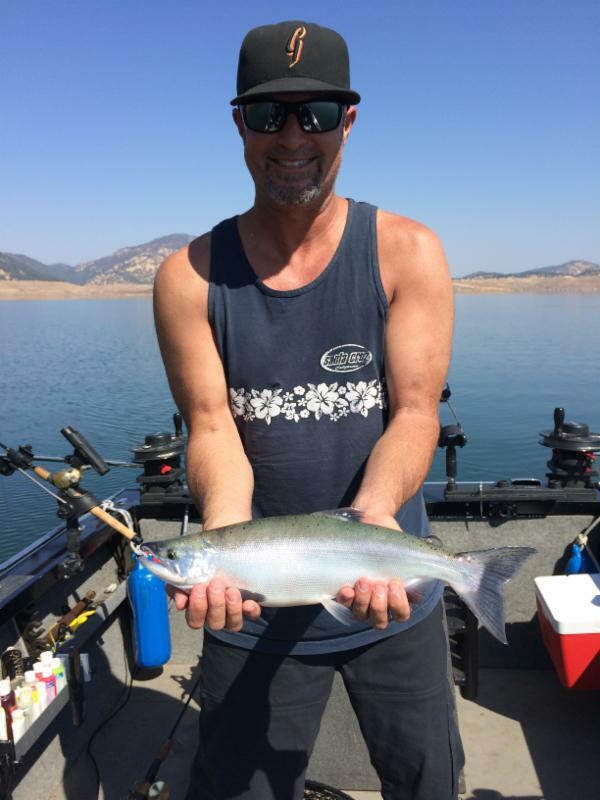 Bank anglers that wish to fish New Melones should try for panfish and catfish. To successfully catch trout from the shore it would be best to head to the high country lakes and rivers. We do encourage catch and release for the brown trout as The Department of Fish and Game will no longer be planting them. Carefully measure, weigh and photograph trophy fish and send us pictures and information. Bob Scruggs and Gary Burns caught a nice 2-pound, 2-ounce kokanee. The bite is almost done for the year, but a few anglers are going for that lake record fish. Kokanee: Slow. The kokanee season is winding down and we received reports of just a few being caught. The kokannee this year are large, pushing 20" and are holding in deep water ranging from 80-100'. 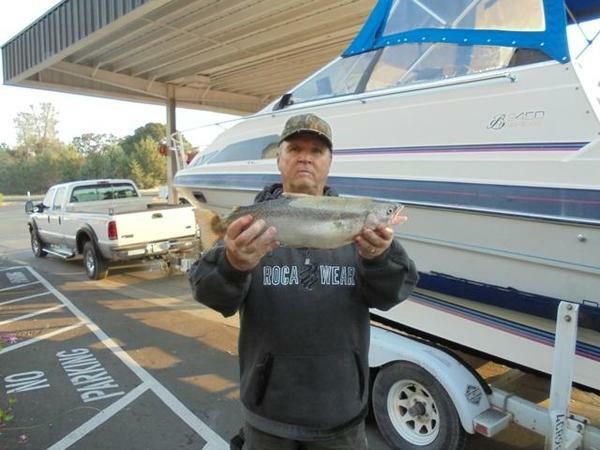 The lake record is 2.8-pounds and was caught by Ray Koch of Escalon in 2007. The largest one that we heard of this year was 2.6-pounds. The lake record is out there and the next few weeks some lucky angler might catch it. It takes patience and the bites are few and far between, but the chance at a kokanee of this size does not come often. The fish will continue to hold in deep/cool water and will start to migrate upriver for their annual spawn. Try fishing in the main lake and up toward the 49-bridge. Use your GPS to ensure you are trolling over the main river channel. Large blades will work best at this time of the year. Swing and vibration are very important and will draw strikes from the largest kokanee. Use lure combinations that have a large profile. An Apex/hoochie combo is tough to beat. Also, many anglers will modify spinners by adding more beads, larger blades and a wiggle disc to increase the action. Be sure to add scent and tip each hook with a piece of shoepeg corn. 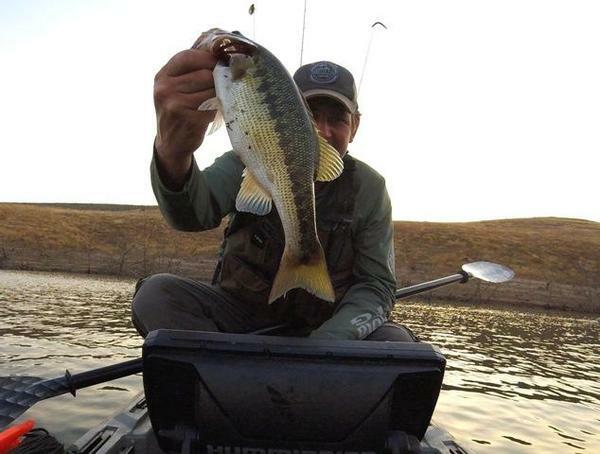 Kevin Dye of Arnold is back at it and catching some nice bass from his kayak. He reported the bite picking up in the evening and catching fish on crankbaits, spinnerbaits and topwater. Bass: Fair. The hot weather and dropping water levels are not great conditions to target bass. Most of the fish have pulled off the shoreline and will suspend over deep water. During low light conditions the fish will push bait back toward the shoreline giving anglers an opportunity to boat a bunch of fish, fast. Try using presentations that mimic fleeing shad and can be used to cover water. Umbrella rigs, jerkbaits and small swimbaits are all good choices. Keep a close eye on your electronics. The fish are down there, just not biting. If you can find an area that is holding fish it will be a matter of time before they start aggressively feeding. When fish are in a negative mood and being very finicky it is best to offer them a subtle presentation. A small soft plastic with a light weight often triggers more strikes. Use a 4" shad patterned worm with a light bullet weight or darthead and shake the worm off the bottom. PLEASE PRACTICE CATCH AND RELEASE. Take photos and carefully release the fish back into to the lake to maintain a healthy fish population for generations to come. Catfish: Good. This is generally a great time of the year to target catfish. Most anglers are catching a handful of chunky 4 to 8-pound catfish on each outing. The best time to target the catfish is in the evening, during the night and in the mornings. However they will bite midday as well. Try using chicken livers and nightcrawler to catch some nice cats. The larger catfish are known to be fish eaters and frozen shad and mackerel should do the trick. Sqeak and Squrl from Sonora/Jameston caught five nice catfish weighing 23-pounds while soaking chicken liver during the night. Crappie: Fair. We have had reports of anglers catching some really nice crappie while fishing at night under a submersible light. The crappie will hold near standing timber. Try anchoring near standing timber or tying to it. The shad will be drawn to the light and the crappie will soon follow. Use live minnows, mini jigs and small swimbaits fished under a slip-float.